About the User: This project was commissioned by a client who provides infrastructure and security equipment and services. Due to the complex nature of some of the projects which they are engaged in, they maintain a strict peer review process to ensure that all quotations sent out are accurate in terms of both content and pricing. Project Brief: While the QuoteWerks ‘out of the box’ Approvals process went some way towards systemizing their review process, it did not completely meet their requirements. Our brief was to provide a solution which would systematically enforce a review process so that all Users were forced to have the quotation reviewed by a peer before it was allowed to be released to the end customer. 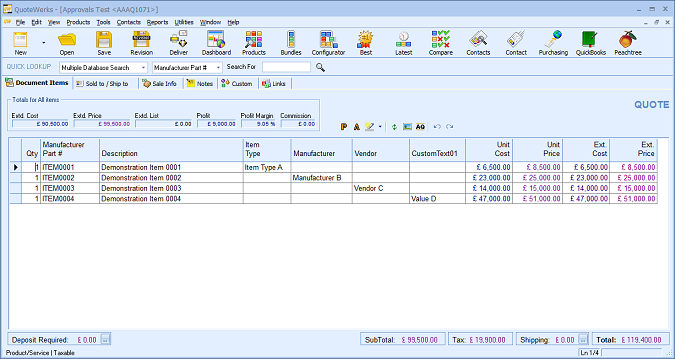 Maintenance of various Rules at both Document Header and Line Item level. For example: flag if the Document has a value greater than £100,000; flag if a Line Item with a Category of ‘Service’ is less than £50. Maintenance of Users to categorise them as ‘Peer’, ‘Escalated’ and/or ‘Executive’ Reviewers. Assigning Rules to Reviewer levels such that a Reviewer of the highest level Status must sign-off a Document before it is allowed to be released to the end customer. Allowing the User requiring an Approval to send a semi-automated email notification containing details of the Rules that have been flagged. 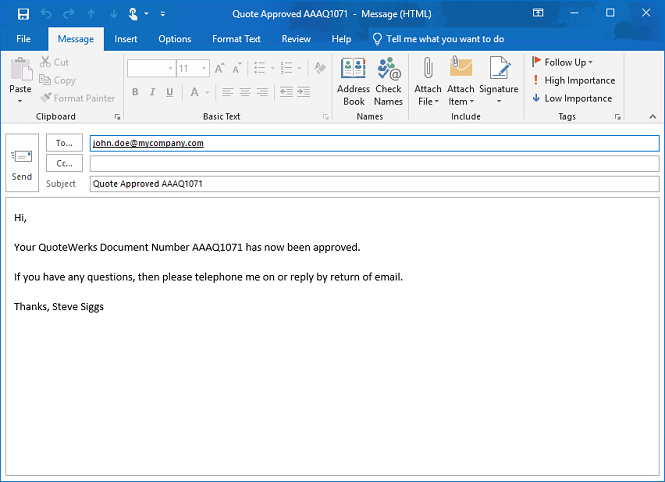 Allowing the User providing Approval to send a semi-automated email confirming that the document has been signed off. 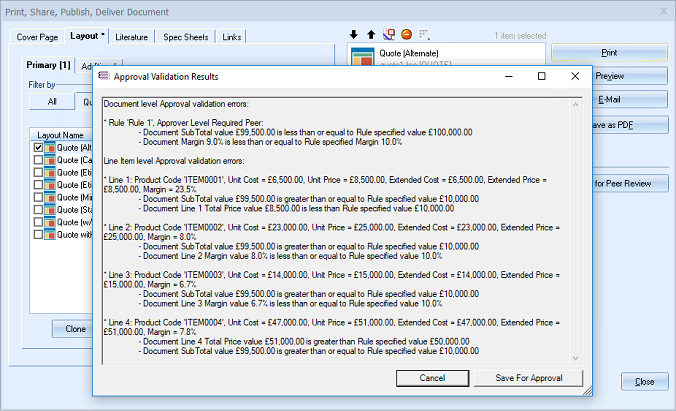 Re-executing the Approvals process if the QuoteWerks Document changed between it being signed off and the User trying to email, print, save as PDF or convert it. Logging when Documents have been Approved and by whom. Various configuration options for Rule and Approver maintenance plus templates for the Approval requests and sign-off emails. The ability to set any number of incredibly granular Approval Rules which must be met before a quotation can be released externally. Enforcement of a strict Approvals process to ensure that Customers always receive complete and accurate quotations. 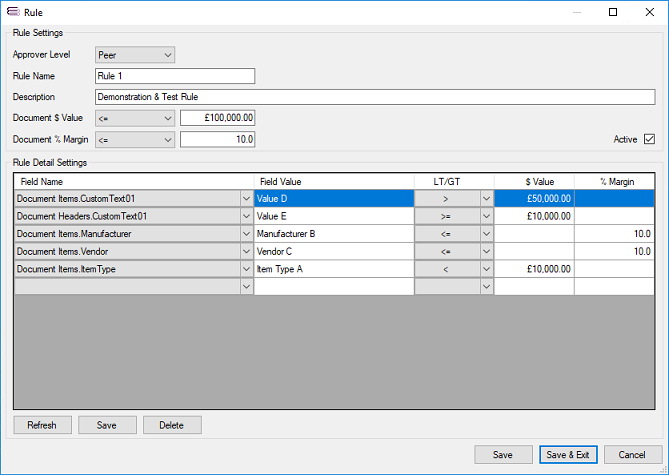 The ability to configure User-by-User which functions they can and cannot perform before their document has been through the Approvals process.